in luxembourg, art is highly present outside museum walls, on squares or in streets. art is now present in the very heart of the city and spread over six basement levels. on the route from the villa vauban to the casino / forum d’art contemporain, it is more hidden… in the very foundations of the city, in the underground car park of royal-hamilius. a venue some might find surprising. but what could be more fitting than a contemporary art trail in a setting designed by the architect norman foster ? between august 27 and September 7 of 2018, six artists took up the challenge laid down by codic international. they each approached the project boldly and enthusiastically, recognizing the unusual venue as a means to reach out to the public in a totally avant-garde way. as if by magic, their murals bring a sense of wonder where one least expects it. they have taken their surroundings and their materials and made heritage - herein lies the originality of the initiative. They have created an extension of the architecture on the walls. 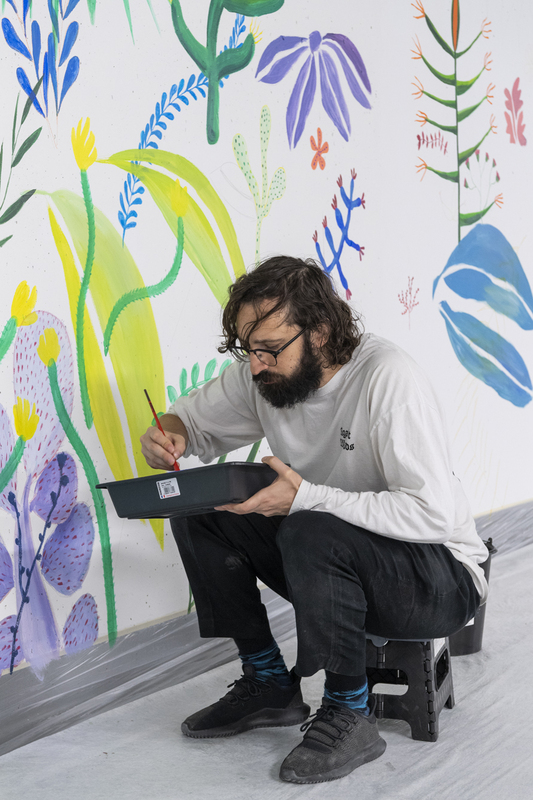 ◡ to be discovered, between basement levels 2 and 7 of royal-hamilius, twelve murals created in situ by six contemporary artists, at the invitation of codic international. in this mineral environment, underground, I wanted to bring nature back. I had planned the overall composition of this slightly crazy imaginary forest made up of flowers, plants and corals. it appeared little by little, as if by magic. each day when I got there, I would take out a plant and put another one in. It was like gardening on a wall - flowers would appear and grow. I was surprised myself. It was a magical experience for me: the car park wasn’t finished when I was drawing and little by little, the people who were working there started stopping to look at my work. I was pleased when they spotted little imaginary beings because it seemed to make them so happy. I thought about children visiting with their families. I believe art can reach people easily, taking them to imaginary worlds that speak to them.